Start this recipe a day ahead. 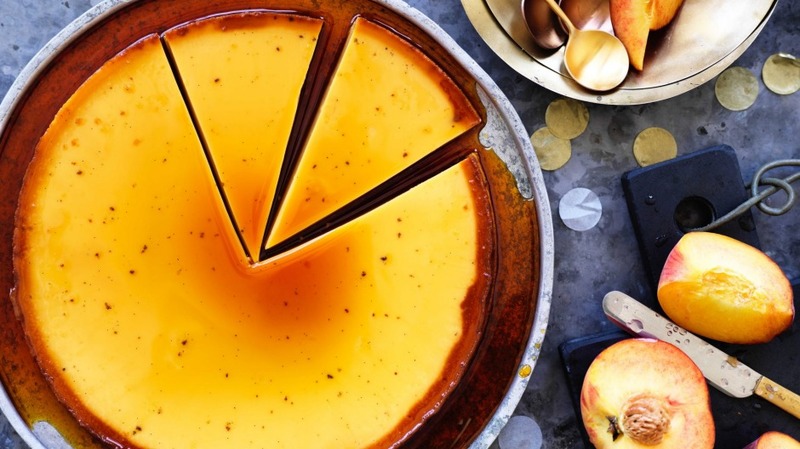 Use whatever fruit you love most with the flan, or perhaps a combination. Australia's fruit is so amazing at this time of year. Place 30ml water, then the sugar, in a small saucepan. Stir gently to combine and place over a medium-high heat until dark caramel (6-7 minutes). Pour carefully (to avoid burns) into a 23cm flan tin, swirling caramel around to coat the bottom and 3cm up sides. Allow to cool. In a mixing bowl, whisk the eggs with salt and about 3 tbsp evaporated milk, then fold through vanilla and remaining milks. Pour over caramel in the tin. Place tin in a large oven tray, and pour boiling water into tray until it comes halfway up the tin. Cover whole tray with foil and cook for 40-50 minutes, until the flan's side is set and the centre a little wobbly. Remove tin from roasting tray and allow to cool before covering and refrigerating to set overnight. Use your fingers to pull flan away from sides of tin, then place large serving plate with a high rim over the top and quickly flip over. Serve with peaches or other seasonal fruit, such as cherries.